Why Choose Kansas for Online Higher Education? A 2013 report released by the Georgetown Center on Education and the Workforce projected that 71% of Kansas jobs will require education beyond high school by 2020. Subsequent analyses performed by the Kansas Department of Commerce and the Kansas Board of Regents echo this prediction. The Kansas Department of Labor also expects a sizable majority of the state’s fastest-growing occupations will demand at least an associate degree by 2022. These trends indicate the increasing importance of higher education for those in the Kansas labor market. This page will introduce you to the online educational opportunities in Kansas for both in-state and out-of-state students, along with rankings of the leading online colleges in Kansas. You will also find resources for locating and assessing program options, navigating the transfer credit landscape, and researching financial aid sources. In Kansas, colleges and universities typically offer lower tuition to state residents. This trend sometimes translates to online education. Some online schools in Kansas charge all students the same tuition fees, regardless of where they live. Others charge nonresidents higher rates. Each school sets its own tuition policy. To qualify as a resident of Kansas for tuition purposes, applicants must reside in Kansas for at least 12 months before applying to college. Dependents of parents who reside out of state do not usually qualify for Kansas resident status for tuition purposes. Applicants must also establish ties to Kansas by obtaining Kansas ID documents, registering as a Kansas voter, or working full-time in the state. Some in-state tuition rates may extend to eligible residents of neighboring states, depending on whether the school participates in higher education reciprocity agreements. Kansas tuition rates compare favorably to the national average. In-state rates for public universities in Kansas rank below the national average. As of the 2017-18 school year, Kansas ranked 20th in the U.S. for college affordability. To get the maximum value from your educational investment as an out-of-state student, carefully research your options to find the most affordable online colleges in Kansas. Applying reciprocity or good neighbor discounts can help you qualify for lower, in-state rates if the school charges residents and non-residents differing fees. Before applying to an online college, check to see if the institution participates in any reciprocity agreements, and make sure non-resident online students do not face any attendance restrictions. Kansas participates in the Midwestern Higher Education Compact (MHEC), an interstate agreement with 12 members including Illinois, Iowa, Kansas, Michigan, Minnesota, Missouri, Nebraska, North Dakota, Ohio, South Dakota, and Wisconsin. Residents of MHEC states qualify for tuition discounts in other member states through the Midwest Student Exchange Program (MSEP), which caps tuition fees at 150% of what an in-state resident would pay to attend a participating institution. Schools take part in the MSEP on a voluntary basis, and as of the 2018-19 school year, over 100 colleges across the 12 member states provide these discounts. The National Council for State Authorization Reciprocity Agreements (NC-SARA) upholds the integrity of online education by ensuring that participating institutions meet high standards. NC-SARA protects students, particularly out-of-state students enrolled in online programs, by guaranteeing member schools offer quality educational opportunities that employers and other accredited institutions will recognize. To qualify for SARA membership, a school must hold accreditation from an agency endorsed by the ED. Non-residents considering online programs in Kansas should check to see if the school holds voluntary NC-SARA membership. 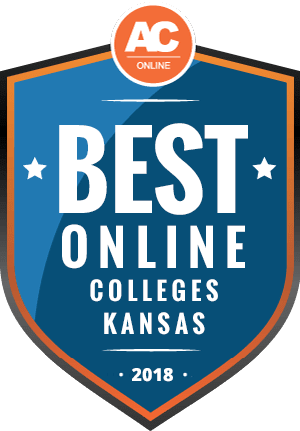 In compiling this list of the best online colleges in Kansas, we considered factors like affordability and the success rates of graduates in the job market, as well as intangibles like the reputation of the school and its faculty. Our rankings help indicate where students can get the best value from online Kansas programs. Use this guide to help you search for schools that meet your needs. The following resource roundup offers detailed answers to commonly asked questions about accredited online Kansas universities. This information considers general trends, so check the answers against the official materials published by schools you are considering. Do online credits cost more or less in Kansas? By and large, online universities in Kansas charge the same tuition fees, regardless of whether a student enrolls in traditional or internet-based classes. For example, the University of Kansas makes no distinction between on-campus and online classes in its tuition fee policy. However, other factors can influence the per-credit cost of Kansas online degrees. For example, schools frequently charge different tuition rates for undergraduate and graduate courses, while other institutions feature variable fees depending on the program. Additionally, at some schools, certain colleges and departments levy further mandatory charges like technology fees and proctoring fees for examinations administered over the internet. Institutions do not specifically include these costs in their tuition fee schedules, but these fees increase the price of earning a degree since students have no way to opt out of them. Which Kansas schools accept the most transfer credits? In Kansas, schools set their own transfer credit policies. The maximum number of transfer credits a school accepts as well as the requirements for transferring college credits vary by institution. Some online schools in Kansas feature more generous policies than others. For example, schools such as Bethel College, Fort Hays State University, and Kansas State University tend to attract larger numbers of transfer students thanks to their inclusive policies. In most cases, students must have earned at least a C grade in order to transfer previously earned college credits to a new institution. Many schools also use the grades earned in transfer credit courses to calculate a student’s cumulative GPA. The Kansas Board of Regents offers a resource that lists university and college transfer credit information for dozens of major Kansas institutions. Use it to make efficient side-by-side comparisons of the transfer credit policies of various schools. Will any online colleges in Kansas accept a GED? According to the Kansas Board of Regents, almost every higher education institution in the state recognizes and accepts the GED in place of a traditional high school diploma. However, some institutions may require applicants holding GEDs instead of high school diplomas to take additional admissions examinations, such as SAT or ACT tests. How many academic terms per year do online colleges in Kansas offer? Most accredited online Kansas schools feature fixed start times that offer a limited number of program entry dates throughout the year. Most schools admit new students during the fall, spring, and summer semesters. At other online colleges and universities, start dates depend on the program, with some programs offering more entry opportunities. However, enhanced flexibility is one of the benefits of distance learning, and it often acts as a major determinant of a student’s choice to enroll in online classes instead of traditional ones. As such, institutions with a strong focus on internet-based education tend to offer more flexible start dates. In such cases, learners benefit from two alternative course launch structures. First, some online Kansas programs run on compressed schedules, with shortened quarters or semesters that run six to eight weeks in length. Incoming students can start the program at the beginning of the next quarter or semester. Second, a limited number of online Kansas universities host programs that allow students to begin virtually anytime. These accelerated options apply to general education classes as well as specific programs that lead to associate and bachelor degrees. Which online colleges will accept FAFSA in Kansas? The Free Application for Federal Student Aid (FAFSA) serves as an important tool for college students in need of financial assistance to meet their tuition and living expenses. It provides an early aid estimate that evaluates an applicant’s eligibility for financial assistance, including Pell Grants, subsidized and unsubsidized loans, federal work-study programs, and some scholarships. The ED offers an easy-to-use online tool that allows students to search for colleges that participate in FAFSA aid programs. Known as the Federal School Code Search, the tool lists 73 Kansas colleges and universities as of the 2018-19 school year. The top online colleges in Kansas participate in FAFSA. Simply conduct a search, then look for the school of your choice in the list of results. Are there any free online classes I can take from Kansas colleges? Major universities around the world began a collaborative project in the early 2010s that developed thousands of high-quality, free online classes. Hundreds of institutions now offer these classes, massive open online courses (MOOCs) at low or no cost to students, who can enroll and start anytime. While students in MOOCs cannot apply the coursework toward an undergraduate or graduate degree, they can earn professional certificates and digital badges that confirm their participation. Kansas State University offers free courses through Kansas State University Global Campus. For those seeking cheap online programs in Kansas that lead to recognized credentials, community colleges offer the next-best solution. They offer comparable educational opportunities at lower tuition rates than typical four-year, degree-granting colleges. After earning a diploma or associate degree, students can then transfer to a four-year degree program. How can I find the online program options at Kansas’s colleges? Kansas institutions make it easy for prospective students to find their online offerings. Many schools place a tab on the main menu of their homepages that allow students to navigate directly to online-only programs. Alternately, you can research a school’s online courses and degrees by entering a search term like “online learning” or “distance learning” into the website’s search feature. Larger schools often maintain separate web portals for their online programs. For example, the University of Kansas system features the KU Online site, which contains everything current and potential online students need. Kansas State University offers a similar setup through its K-State Online web portal. Students in need of financial assistance should start by considering Pell Grants, which do not require repayment. However, eligibility for Pell Grants only extends to undergraduate students pursuing their first degrees. Bachelor’s degree holders do not qualify. This renewable grant offers financial assistance to college-bound high school seniors and undergraduate students based in the Geary County, Kansas area. Applicants must demonstrate financial need and provide copies of their high school transcripts, SAT scores, ACT scores, and at least two letters of recommendation from current or former teachers. Candidates must also supply copies of their parents’ tax returns to confirm their eligibility. Open to applicants with GPAs of at least 3.3, SAT scores of at least 1680, and/or ACT scores of at least 24, this scholarship provides financial assistance to Kansas and Missouri residents enrolled or planning to enroll in a bachelor’s program in either state. Non-residents can also apply if they attend or plan to attend an accredited bachelor’s program in either state. College-bound Kansas high school seniors who have completed the Kansas Scholars Curriculum and earned state scholar status may apply for this scholarship. Applicants must also demonstrate financial need and place within the top 20% to 40% of high school graduates statewide in terms of academic achievement. This scholarship provides financial assistance to members of ethnic minority communities who attend college in Kansas and maintain high levels of academic performance. Applicants must identify as one of the following: African American/Black, Native American or Native Alaskan, Hispanic or Latino/Latina, Asian/Asian American, or Pacific Islander. This scholarship rewards Kansas students in bachelor’s education programs and trained teachers seeking licensure in educational disciplines that meet the benefactor’s “hard to fill” criteria, which changes annually. Applicants must also file FAFSA forms, hold Kansas residency status, and maintain enrollment in an accredited Kansas higher education institution.